If it’s your own anniversary then you will probably be getting your significant other a gift and card. Knowing what to say or write in your anniversary card can be a bit difficult though. Expressing your love for him or her and making it touching and heartfelt without being too cheesy is harder than it sounds. A good way to do so is reflect back on happy memories or try to sum up your feelings in a quick sentence. If you’re sending your wishes to a couple who are celebrating their anniversary then you can tell them how great a couple they are and that you admire their relationship. If it’s a family member or your parents then you can be more personal and perhaps even use an anecdote from their lives. You might also want to consider a funny message if you feel it is appropriate. 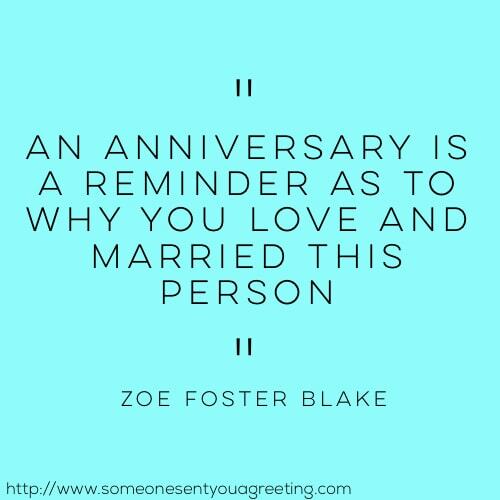 Whatever sort of quote you choose to use, if you find yourself struggling with an anniversary message then try some of the examples below. Hopefully they will help you find the right words for the perfect message. You can use them as inspiration or copy them exactly as they are. 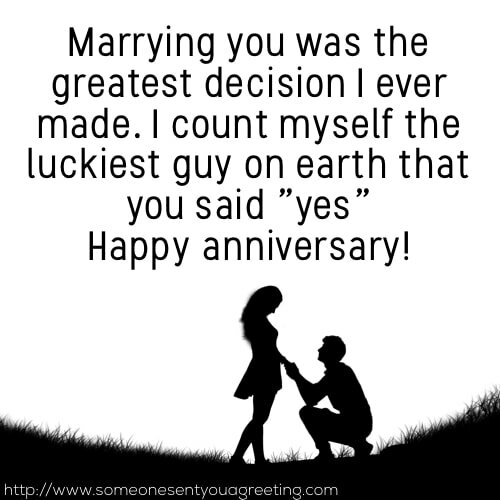 These Anniversary Quotes are fairly general and would fit most scenarios or couples. They do a good job of reflecting the love and commitment a long relationship has and hopefully sums it up well in a short message. Every year I feel like the luckiest person in the world as I think about how I get to spend my life with my best friend. Happy anniversary! I never knew what true happiness was until I found you. Thank you another year of joy, happy anniversary! When it’s your own wedding anniversary you’ll want to reflect the happy years you’ve had together, taking that love and devotion and putting it into your card message. The below wishes and quotes are written for a husband and can be used or changed to fit your own. Happy anniversary to the best husband in the world! Until I met you I felt incomplete. You’re my soulmate and love of my life. No one else would understand our relationship, and no one else in this world would understand me the way you do. Happy wedding anniversary! I treasure every memory we’ve made together, every discovery we’ve made about each other and every moment if happiness you’ve bought to my life. Thank you for choosing me as your better half. Happy anniversary! From the first time our eyes met I knew we were meant to be. I thank every day you chose me. Happy anniversary hubby! 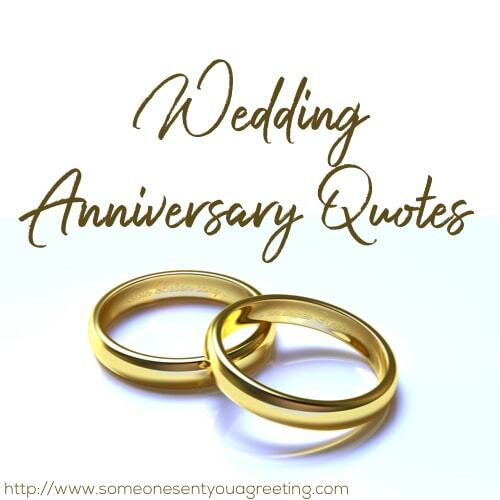 Much like above with a husband if you are wanting to send or tell your wife how much you care about her on your anniversary then use one of these quotes below. Marrying you was the greatest decision I ever made. I count myself the luckiest guy on earth that you said “yes”. Happy anniversary honey! I can’t imagine living a life without you. I’d probably be doing the dishes, laundry and having to cook for myself! So a big thanks! If you know a happy couple who are celebrating their anniversary then a card with a lovely message or quote is the perfect way to wish them a happy day. Wishing you a love that never ceases to grow. Happy Anniversary to a great couple. 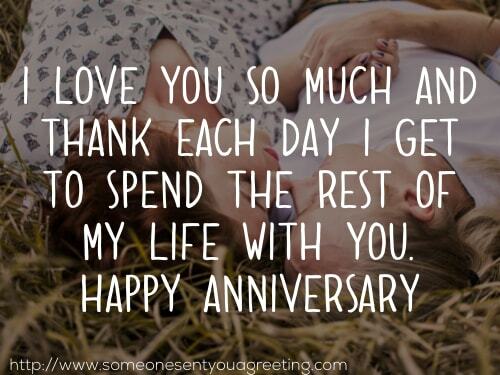 As each year passes your relationship and love for each other continues to grow. You’re an inspiration to us all and a shining example of what happiness can be. If your partner is the right type then a funny quote or message could be the perfect way to let them know you care. A clever tweaking of your relationship will put a smile on their face and remind them of the fun you have together. Today we celebrate the best decision you ever made!